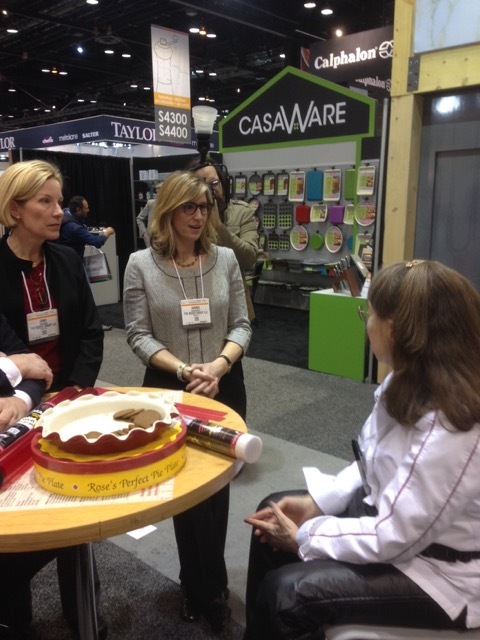 This was our third appearance at the International Housewares Show in Chicago. Dan O'Malley, of the American Products Group, hosted us to promote the new Rose's Signature Line, which includes my SynGlas nonstick rolling pin, dough mat, fast tracks (dough guides), cutting mat, and mini rolling pin. 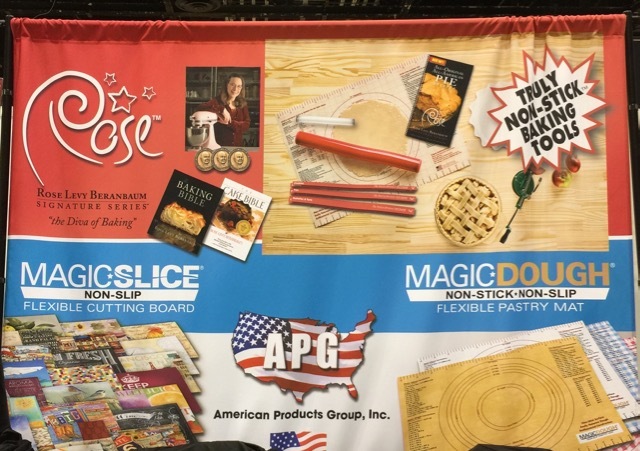 The APG booth was constantly overflowing with prospective buyers, APG staff, and representatives. Woody and I were delighted to have been invited to present my new line in action at the KitchenAid Cooking Theater. We demoed our favorite flaky piecrust and cherry pie. 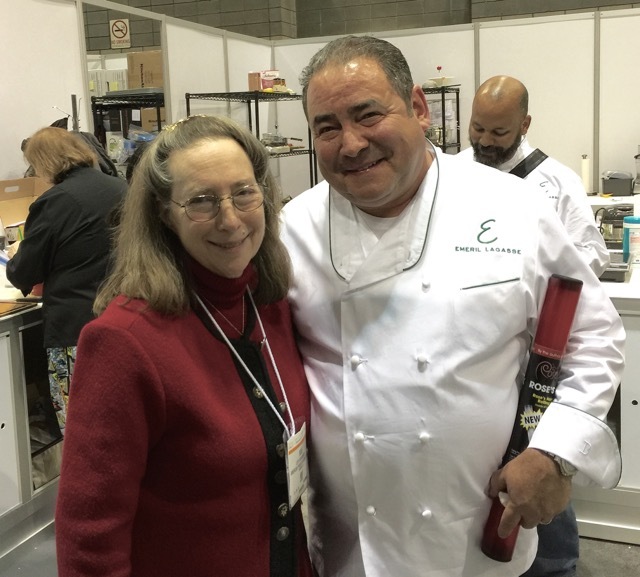 When we entered the backstage prepping kitchen to go over our lists and to prep for the following day, my dear friend Emeril Lagasse, who was just about to give his presentation, took the time to give me a big hug. He asked if I would like a second set of hands for our demo and tempted as I was, I declined realizing he was needed at his booths to promote the re-launch of his product line. The demo turned out to be the perfect testimonial for the truly non-stick rolling pin and dough mat. 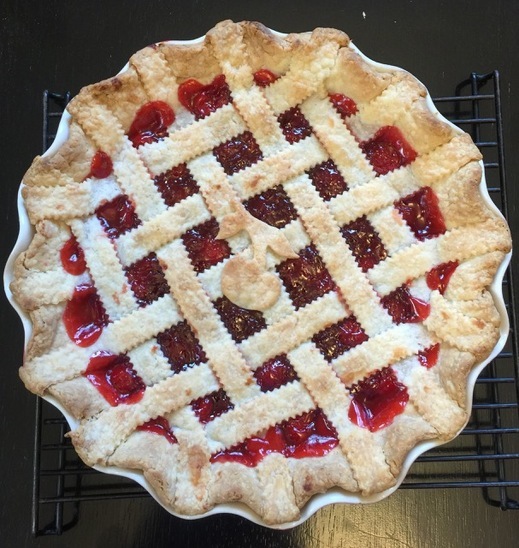 Although the recipe, like most butter based pie crust recipes, advises to refrigerate the pie crust for 40 minutes to rest and firm after mixing, we had to use the room temperature dough that was just demoed. With just a mere dusting of Wondra flour on the dough mat and dough, the crust rolled out easily, without sticking! 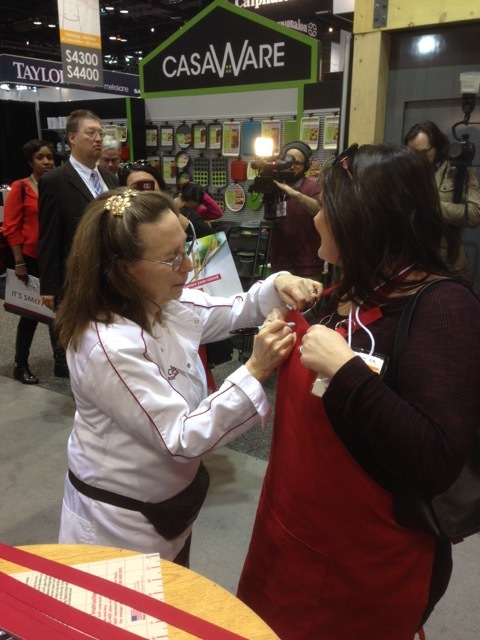 In addition to meeting many people at the booth, including two women bakers who asked for me to sign their aprons. It was great to meet one of APG's top reps, personality plus Jenny Johnson and her talented designer/partner Andrea Daugherty. 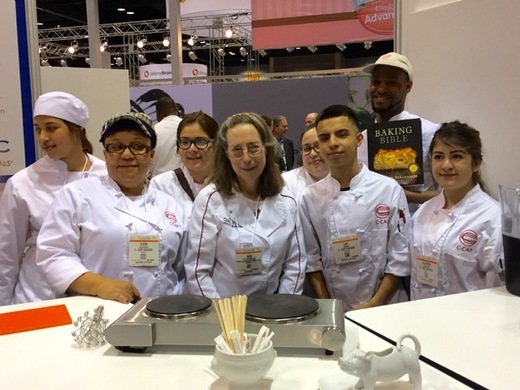 We walked several miles each day, stopping at many of the 2000 plus booths, including visiting Sam Weiner at our favorite knife sharpeners and waffle makers booth: Chef's Choice/Edgecraft We also visited my product display at Harold Import Company, home of Rose's Perfect Pie Plate. 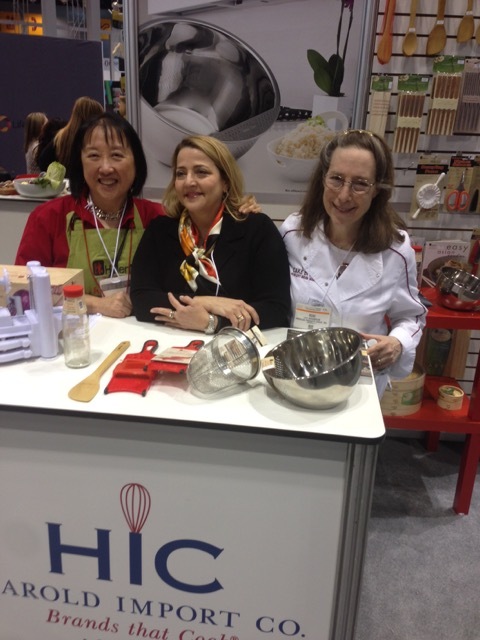 It was a delight to see my wonderful friends Elizabeth Karmel and Helen Chen, representing their product lines. 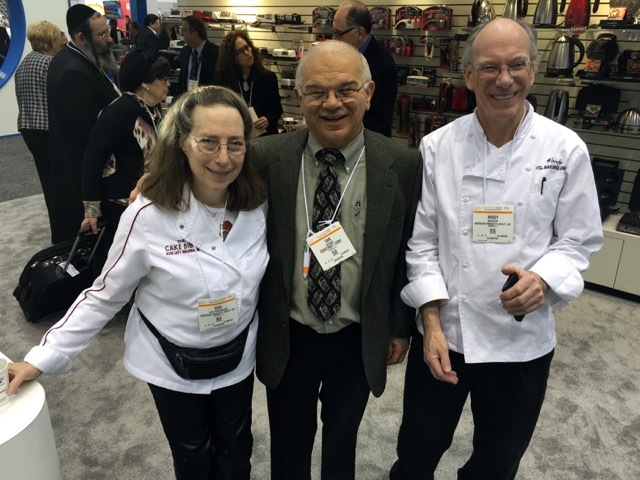 It was Elizabeth who introduced me to Harold's Kitchen owner Robert Laub. She now also has a beautiful new French porcelain line with Revol--check out the red roosser roaster! And I love Helen's new and very useful rice and quinoa rinsing bowl which I'm holding in the photo. And it was heart warming to see the enthusiastic young C-Cap student chefs clamoring for a photo with their hero (could it really be me?!) We gave them 4 signed Baking Bibles. Evenings were reserved for enjoying some of Chicago's best restaurants, including The Girl & The Goat and The Purple Pig. Dan hosted a delightful dinner at the appropriately named Rosebud's Steakhouse. Our last morning, before taking off for Minneapolis, was a conversation-filled catch-up breakfast reunion with Janet Besk Zaslow, one of my favorite students from when I had the Cordon Rose Cooking School many years ago. I was very impressed by her album of baking photos including wedding cakes she had been inspired to make over the years. Tune in next week for the Minneapolis leg of our Midwest Visit.